HMS WESTMINSTER (F237) a Type 23 Duke class frigate built by Swan Hunter, Tyne and Wear and launched 4 February 1992 and commissioned 13 May 1994. She is the second Royal Navy ship to bear the name. Internal shots of her were featured in the 1997, James Bond film Tomorrow Never Dies. In 2004 she received the first of the Merlin helicopters and was fitted with low-frequency 2087 Sonar, designed to detect the most advanced submarines. In 2008 she was deployed to Burma for the British relief effort following Cyclone Nargis. Other operational duties include enforcing the naval blockade off Libya in March 2011 and anti-piracy patrols east of Suez. HMS Westminster is 436ft 4 in long and a displacement of 4,900 tonnes. Her motto is: For Nation and for Glory. 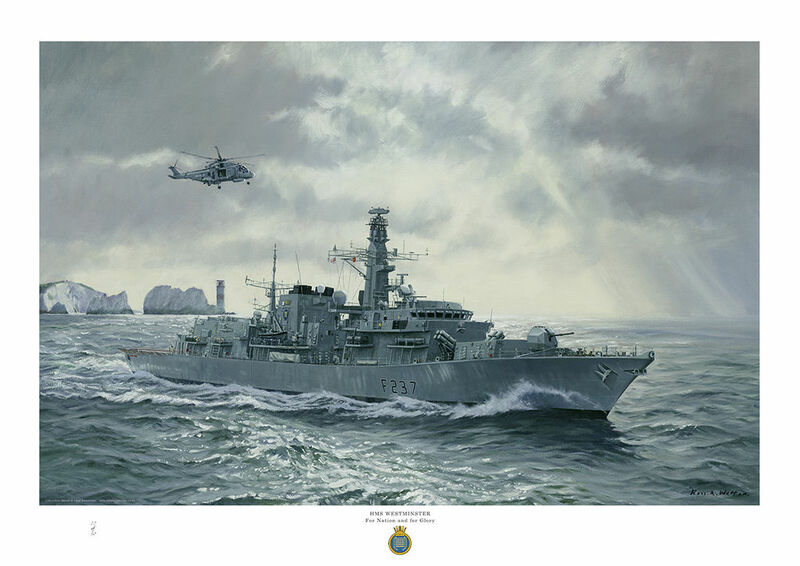 HMS WESTMINSTER is shown off the Needles in the Isle of Wight, the original is owned by a collector in Germany.